I find this whole charade with regards to Venezuela just a further nail in the coffin of any semblance of realism and further s my argument that we are truly living in an idiocracy here in the so called liberal western world. Like the so often and pushed phrases like the International order of things. Or our western values that are tried and proven . Thank goodness for these exceptional western values that we have had the privilege of experiencing in this dystopian post modern world. Lets get to May Thatcher on Valium. Well “Brexit means Brexit” Yeah right so know they are floating the idea of another referendum. Democracy alla post modern Fascismo purro.Then there is Mark Carney the British chairman of the Bank of England who has the audacity to deny access to the sovereign government of Venezuela their gold that is in their custody. Well that is shear theft. Remind anybody of Libya and the missing 86 billion dollars in Gold and silver. Then let us not forget the M in this exclusive club Macaroni man. Yes the man who is King of the country that gave us LIBERTE <FRATERNITY. Well lets look at Malawi and Libya. Great holiday destinations all do to the great military investments and destruction of the aforementioned countries He can not even acknowledge or have the courage to have any dialogue with the gilet jeune instead 100's maimed for life and a few dozen have been killed. Benito Mussollini is laughing in inferno while we are living his dream and the united Europe project is fact that we are living his prodigy Hitlers dream , remember my dear readers that Mussolini in 1915 with the help of French and British secret service money was bankrolled into opposing the socialist and initiating his right wing rise further more during the BIENIO ROSSO wrote an op ed in his paper wher he first coins the phrase the Lo Stato Corporato the corporate state. which my fellow humans is FASCISMO 101. Look around and smell the roses its full of thorns the largest wealth gap exceeding the Gilded age. The largest displacement of humans exceeding the second world war. But hell we have our western liberal values free choice wi-fi AI and 5G let us not forget the uberfication of everything. Hence Maduro has no legitimacy . [Theresa] May — Thatcher on Valium. Joerg, many thanks for introducing me to Pawel Kuczynski: graphic artist and anti-war philosopher. The gentleness of his pictures is as genial as the directness of his message. So sweet and green and brown and pastoral was the scene in your Link, it took me some time to realise that tall column in front of The White House was the long nose of Pinocchio. Trump obviously wants to enter the history books with a glorious (or “awesome”) war. But his intention could relate to much more than just Venezuela. I think Thierry Meyssan once again had a good intuition: Please read his – already six weeks old – article “THE UNITED STATES ARE PREPARING A WAR BETWEEN LATIN-AMERICAN STATES” – https://www.voltairenet.org/article204400.html . Joerg, thanks for that link, Thierry Meyssan with an eye-opening revelation of new Skull Duggery being spaded by Uncle $cam in his old “backyard”. … no all thanks to You. 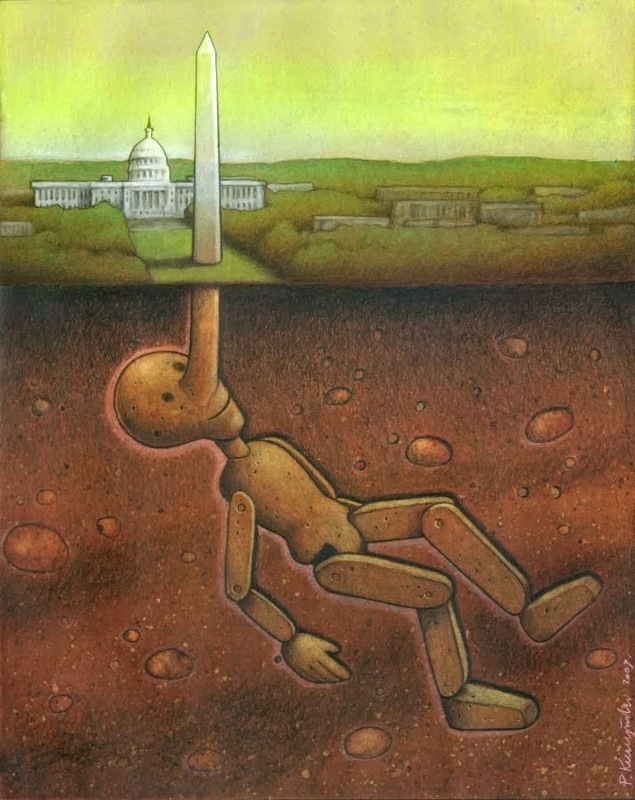 I didn’t even know, who Pawel Kuczynski was. Just picked up his cartoon some 5 years ago. Great link you gave me! this is the third time my comments don’t appear where I placed them. To change our relationship with propagandic and opinion manufacture narratives: Caitlin Johnstone suggests switching focus and attention to beauty – to distract from the assumptive encultured mind-chatter. Which is to say: switch focus away from the conceptual, to the actual and experiential. Which is a pure Zen manifesto. If we take the beauty, novelty and infinite uniqueness of the moment as the primary core consciousness …a new way of seeing and knowing arises. If we look past the old, habitual, encultured mind – to see deeply into the lived experience – we can see reality unfold with us: as us …when beauty and not-beauty coincide. Such pure perception cannot be managed – it is Such (tathata). Suchness is normative, regenerative and restorative. As life cognisant of life …in the co-mutual embrace and enaction of life. As Caitlin attests: when the propagandic imaginal world is stripped and emptied of its habitual daily processual of perception management – it is revealed as a regime of untruth and unfreedom …viewed as a primal seeing and knowing (jnana). Identifying its incoherences and misperceptions provides the root corrective and affords a praxis of enaction. The way of seeing that-which-is-as-it-is is generative of a Zen manifesto of an emergent politic of unity. To co-evolve further: the basic fundamental assumptions – of self, mind, separation, and hierarchical sectarian Otherness – that govern the dualistic propagandic imaginal need to be challenged and evolved. Jnana is the evolutionary key. like a baby in extended incubation, when one knew from the outset , not least because the BBC had kindly announced the WTC 7 collapse before it ever firkin’ happened and I heard them and saw the building still standing over her left shoulder, live ! So i was ready & waiting then, all prepared for those very first few seconds when WTC 7 began to implode on its’ own footprint, (impossible without explosives) and there they were visible on film, almost half an hour later after the announcement: time enough to make popcorn, drink coffee , smoke and let the show begin, “Beautiful Mess” , finally I thought, they’ve blown it this time, nobody will fall for this huge shot in the foot … nobody could be so dumb >>> simple . . .
“The mythical PetroDollar strikes again”, eh Joerg? There’s no such thing as petro dollars. What a racist and supremacist anglo-saxon arrogance…!!! Do ‘Latinos’ (Spics?) have to be toothless, rachitic souls dressed in rags to protest against the unconstitutional rule of a moron that is ruining their country, just to keep the presumptuous and ignorant creed of an ‘anglo’ loony left of cowards that are the agents of globalist slavery…???!!! Do they have your permission, oh Lords of the North, to defend their Constitution (Created by Chavez) and their legality…???!!! Can these poor Banana Republics, like leftist Spain, Ecuador and Costa Rica or ‘rightist’ Brazil and Colombia, oppose the immigrationist attacks of the Misgovernment of Venezuela, that has been destroying its country for 20 years…???!!! Do they have to negate what is evident just to keep you happy with dreams of fake revolutions in your ‘metropolis’ oh Masters of the Boreal Kingdoms…???!!! Mike Pence believes it should be left up to neoncons like him to ‘phone in’ the leader of democratic states. Apparently Juan and Mike Abrams, the man who loves overseeing torture in Latin America have become inseparable at the local death squad team building days. Yes, these “toothless spics” apparently need the Three Amigos, Pompeo, Abrams, and Bolton (or maybe the Three Stooges) an odd ragbag of warmongers, convicted perjurers, death squad and torture queens, war criminals and corporate lobbyists, to decide what is best for these poor benighted lesser breeds in the interests of “democracy” and select an IMF approved candidate to rule over them, So much more convenient than free and fair democratic elections. Why, Bolton is even thoughtfully and helpfully offering to haul off the elected president of Venezuela in chains like they did with their uppity satrap Noriega to his own cell in the Guantanamo Concentration Camp. I especially appreciate the paragraph about ‘whataboutery’ in the final notes of your article. I have had a native dislike of the term, but your point about using it to avoid the discernment of patterns is exactly correct. “Aha” as the expression goes. There are several indications that the Canadian government is deeply implicated in this coup. The Foreign Minister Freeland is one of the leading lights in the Lima Group whose mission is to promote regime change in Venezuela. They are meeting again next week in Ottawa. And the call to the Guiado puppet character that initiated the coup attempt came from Freeland, it was followed by another from Pence. Characteristically Freeland’s initiatives in this matter are being widely leaked, there have been several accounts of how the Canadian embassy in Caracas has been pushing the entirely bogus propaganda that the recent Federal election (may 2018) was unfair. As Joe Emersberger points out in counterpunch today this is nonsense. In fact even though the US backed opposition boycotted the election, Maduro still received a larger share of the registered electorate than either Trump or Obama did. It would be interesting to discover how much money and other resources Ottawa has devoted to sabotaging the government of Alberta’s only competitor in the tar sands business. Then there is this report from mintpress, which links the propaganda with anti-Syrian government sites, also part of the Initegrity Intiative-NATO- Five Eyes propaganda network, intimately connected to the Ukrainian fascists, another of Freeland and Canada’s pet causes. “SouthFront –– The Twitter account of the pro-opposition blog “In Venezuela,” appears to be run from Toronto, Canada, and an in-the-field news source run by Bellingcat member, Giancarlo Fiorella. This article doesn’t really need to be so fixated on a single editorial to make its argument, which aims at a broad generalization we are already acquainted with. Proving the wheel is round, really. When you consider we are engage in a time where many people are just now waking from the illusion of managed perception from the MSM, it is especially articles like this I can use in my blog to use as a measure of how they’ve been trapped in that illusion. Individuals are always waking up from the MSM, just as individuals are always falling in love or crashing cars or getting into folk music, so not sure you’re making much of a case there. And for those of us who lived through both Iraq wars and 9/11, the process is almost 30 years old, so this piece is very much superfluous to requirements. You might as well say: We know how to cross the road, so there’s no point in teaching children how to do it. Go and read Jonathan Cook, you’re far too easily impressed. KingFelix, thanks. Jonathan Cook comes highly recommended. “Cook was a freelance sub-editor with several national newspapers from 1994 until 1996. He was a staff journalist at The Guardian and The Observer between 1996 and 2001. Since September 2001, Cook has been a freelance writer based in Nazareth, Israel. Until 2007 he wrote columns for The Guardian, a publication which, he argued in 2011, limits the expression of dissent by its attacks on Gilad Atzmon, Julian Assange, Noam Chomsky and other Truthers. Articles by Cook have also been published in The International Herald Tribune, Le Monde Diplomatique, Al-Ahram Weekly, Al Jazeera, The National in Abu Dhabi, CounterPunch, The Electronic Intifada, Mondoweiss, and AlterNet among others. In 2011, Cook received the Martha Gellhorn special award for journalism, “for his work on the Middle East”. Not surprising to find that Cook’s has also been honoured along with Jeremy Corbyn as “antisemitic”. His website has a good Link to the U$ President Factory that manufactured France’s president Micron and is currently trying to launch their latest model for Venezuela. Cook lives in Nazareth, Galilee, a big town not far from my little town in Galilee. Blatant, in your face, imperialism. All that’s needed are the Pith Helmets. Well I suppose we can now dispense with the United Nations, national sovereignty, International Law, it appears that Might is Right. And here you have the EU, and its cringing Petainst wretches, as usual, giving diplomatic cover to the imperial rogue elephant in the room, the USA. I mentioned recently the lack of comments generally these days in the Guardian and no comment on Caracas. It was quickly moderated. You are a very naughty boy. How more threatening can you be? Surely one of these days a moderator will jump ship and spill the beans about the orders they march to. Apropos the alleged illegitimacy of last year’s elections in Venezuela as claimed by all western MSM, some British Tory politician Foreign Secretary Hunt perhaps? baldly stated that ‘the ballot boxes were stuffed’ in support of the allegation. Howevere, Venezuela does not use paper voting slips, but uses a British electronic vote registration system. his hair done. When there he realised that there could be no better place to display his new hairdo than the UN General Assembly, to which, as a junior minister, he was entitled to get a ticket. The speech itself had to be made up quickly. The attached link makes for illuminating reading. It’s a letter to Mogherini in the EU from a number of international observers at the 2018 Venezuelan election refuting in no uncertain terms the EU’s statement about the status of the election. Here is one of the “Founders” of Political Photographic Disinformation. What’s also rather amusing, in a grotesque fashion, is how, suddenly, people in the UK media and politics have become, overnight, experts in far away Venezuela, after having expressed next to no interest or knowledge about Venezuela previously. My, they are such quick learners! This reminds me of how they in the twinkling of a eye began to lecture me on what was happening in Ukraine, where my family owned land and had a history going back several hundred years as they moved eastward from Austria. The photo is interesting because of the way it’s been cropped and the angle it was taken from. Literally one can, at most, see a couple of thousand people within the narrowly chosen frame of the photo, why so few if the ‘people’ are rising up in their millions to show their opposition to Maduro’s government? Because they aren’t rising up in their millions. The photo is highly manipulative and problematic, pretending to show a mass movement, the people on the move for liberty and justice, yet, it actually shows nothing of the sort because those images don’t exist. In a way the photo itself is indicative and symbolic of the way our media ‘frames’ the entire situation in Venezuela, ‘cropping ‘ complex reality in order to fit a predetermined narrative and fixing the ‘facts’ around the policy, which is regime change regardless of what the people of Venezuela think. I think most of us here saw through the Guardian long ago. Perhaps more important is asking how to wean the current readership off such propaganda without them losing their jobs? The upshot was that Yanukovic fled for his life, secessions of the Don Bass and Crimea took place, in addition to a civil war which still simmers. It was argued that Yanukovic was a corrupt oligarch, true, but so was everyone else who subsequently took power – ILLEGITIMATELY – in rump Ukraine. In any event Yanukovic was coming to the end of his term of office and there was a presidential election due in 2015. Ah but the sans culottes at the Maidan and their US-EU backers couldn’t wait for this. The coup was finalised in February 2014 and as a result Ukraine is now ruled by a totally incompetent, corrupt, venal collection of quasi-mafia elites and neo-nazi militias. Ukraine is now the poorest country in Europe except for Moldova. It is also rapidly depopulating and has lost 10 million people who have left this economic and political basket case. So much for the revolution of dignity. “Timeo Danaos et dona ferentes” is a Latin phrase from Aeneid (II, 49). “Timeo Americanos et dona ferentes” is a Latin phrase from Ukraine? “Timeo Los Gringos et dona ferentes” is a Latin-American phrase from Venezuela. little Vicky nuland explaining the 5 billion she spent over throwing the Ukraine govt. Your picture of the pro Maduro rally cannot be entered from your page, only from youtube, because AFP has complained. On twitter a picture of a large peaceful Maduro rally is covered and labelled as potentially sensitive material https://mobile.twitter.com/Larissacostas/status/1090296799213088769 I guess propogandists are very sensitive souls when it comes to alternatives to their viewpoint. Andy, can you blame them? That pro-government crowd is just huge, monstrous (compared to the anti-government one). It might frighten the children. Now that line was placed after but separate from a para which referenced ‘the UN human rights office’ implying that this was the source for that complete tosh – those of us familiar with Viner’s sleazebag of dirty tricks can be sure that is not the case – other wise this august journal (hoick – spit) would have said so. Last week when this fishwrap kicked off their Venezuela coverage with an opinion piece saying everyone who is not a venezuelan should stay the f..k away I assumed that the graun’s reader’s contributions were insufficiently generous, so the graun had eased up on the empire spruiking so as not to alienate too many more of us – (hands up if you have responded to their constant entreaties for more dosh by telling ’em “not until you lift your game and quit with the lies and empire enabling tosh”) – yep pretty much all of us. Anyway it only took a couple of days and doubtless a few stern words to Viner, for the rag to push out flimsily manufactured lies about Venezuela. I don’t live in england but if as seems likely the paper will continue to spread BS advocating a US imperial invasion of Venezuela, that it is time for those who do live in england to en masse express their dismay loudly & relentlessly outside graun towers or whatever it’s called. Creeps like Owen the faded schoolboy Jones and George the corporate puppet’ Monbiot need to be called out publicly to make sure everyone hears that this pair of tory abetting scumbags are not regrded as truthtellers by discerning readers. Our local rag, the Los Angeles Times, duly trotted out an OpEd piece on Veneuzela when this latest ‘crisis’ hit that pressed all the right buttons. It talked about an unpopular, incompetent, President that was elected by dubious electoral techniques, a popularly elected assembly that was opposed to him and so on. I thought it was an exercise in irony and wrote a short note to the editor pointing this out since the talking points could quite easily apply to the US. I kept away from questioning the veracity of their assertions — it wasn’t important in this case, just take what was written at face value and change a few names. I did point out that it was unfortunate that it was an oil producer since states that produce this commodity that don’t play the (our) game seem to suffer unfortunate outbreaks of “freedom and democracy”. Obviously it didn’t get published but, more significantly, every week they publish a numerical summary of letters to the editor and Venezuela didn’t figure at all in the count. Interesting….. Opinions BTL are equally abysmal when it comes to Venezuela (although the Guaridan will memory hole any analysis which strays too far from that approved by the party). Some commentators are so conditioned by identity politics that they barely raised a murmer when their golden boy, Obama, described Venezuela as an “extraordinary threat to national security.” Yes, for Barak Venezuela was a brooding menace that could only be dealt with by imposing damaging economic sanctions (amongst other things). irrespective of the serious harms that could all be too easily anticipated. It simply did not occur to Guardian liberals that such claims lacked logic or indeed any form of credibility unless ‘extraordinary threat’ is defined as not doing precisely what the Wall Street financiers tell you to do because from where I am sitting it just sounds look another piss-poor excuse for the US to bully a weaker nation. Trump of course has cranked up the pressure which must have created some degree of cognitive dissonance for the Guardian because they are probably unsure who to hate the most Donald or Maduro? At the same time it fails to dawn on many of the Guardian commentariat that while the US feigns concern about conditions for ordinary families in Venezuela they are at the same time heavily complicit with a war that has led to starvation and a deadly cholera outbreak in the Yemen. Economic hardship – Corbyn – socialism – Soviet Union & China – overthrow any non-right wing government. Does it not occur to these fuckwits that public support is an important ingredient in the never-ending cycle of violent regime change? Marine General Smedley Butler’s, ‘ War is a racket’ and William Blum’s ‘Rogue State’ are essential reading to understand the depredations by the US in it wars of Corporate profit over the past 150 years. While waiting on a coffee today, I flicked thru The Age, a sort of slightly ‘progressive’ Australian Guardian. The sort of rag that has screamed blue murder about Trump. Until today. Lo and behold, a ‘story’ on Venezuela states the United States was right in doing what it did, viz, the Coup, and Trump was right in doing it!!! Yet they’ve banged on and on about Trump and Putin and Mueller and all the other deranged fairytales they spew out. But hey, Trump is right in overthrowing the legitimate Venezuelan Govt according to The Age! Nevermind the UN Charter or International Law. This same story proceeded to completely demonise the Maduro Govt. Just to stick the boot in. These people live on Jupiter. And all this garbage is so transparently blatant now. Its right in your face blatant. The Age (especially the online version) is basically a real estate brochure with a sprinkling of news. Now that they’re owned by the same corporate oligarchs that own Channel Nine, the paper version is only good for lighting fires and lining cat litter trays. The Age has been like this for years unfortunately. My favourite is when they run with the headline: China is Australia’s/World’s greatest threat. So I go to the actual article and it’s a quote from some inbred US general war pig. Our ‘news’ comes directly from the US elites and has nothing to do with our citizens. Frankly, resistance is fertile; otherwise we wouldn’t be on this site. It doesn’t really matter whether you have an orange trained monkey or a black trained monkey or a woman trained monkey or a gay trained monkey or even a trannie trained monkey in the White House, it’s all the same to its Zionist organ grinder, just so ,long as it rattles its little tin cup on cue. You could just as well vote for a pig’s bladder on a stick for all the difference it makes.